There are 3 different types of font available. Sans-serif and Serif can handle pretty much any character set from any language, but Hand can only be used for Latin script languages (e.g. English, French. Not Chinese, Russian). Selecting a font size will affect the size of fonts across the whole worksheet. Some worksheets have an "Auto" setting, which is recommended when available. Setting the font to "Auto" will mean that text will scale automatically to fit words or sentences of varying lengths on cards or grids. The worksheet title will appear at the top of the worksheet and will be the saved name for the worksheet on your "My Worksheets" page. 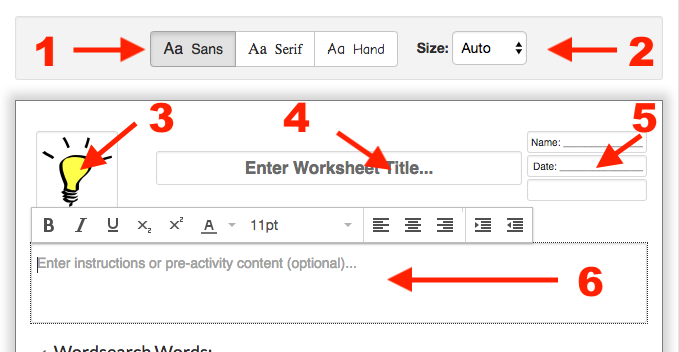 There are three small text fields in the top-right corner of the worksheet header. By default two of them are used for "Name" and "Date" lines, and the third is empty. You can customise these simply by editing the text. To extend or shorten the lines use the underscore (_) key on your keyboard. If you want nothing to appear in the top-right of the header simply delete all the text inside the three fields. You can optionally enter instructions for most worksheet types which will appear below the worksheet header. When you click in this field a formatting bar will appear, which will allow you to change the instruction text styles, alignment, size, and colors. Writing exercises can be useful for students to demonstrate or extend learning from the activity that they have just undertaken. Click on this button to add a writing exercise below the main worksheet content. A dialog box will appear, in which you can specify how many lines you want and whether or not they should be numbered. Close the dialog using the X in the top-right corner. Click on the text above the writing exercise to edit its instructions. Footers only appear on PDF output, not HTML. If a worksheet generator has an "Answer Sheet" option a checkbox will appear here. If checked an answer sheet will be appended to the student worksheet. This can be set to either "A4" or "US Letter". A default is chosen based on the country you entered when signing up. You can change your default from the Edit My Details page. 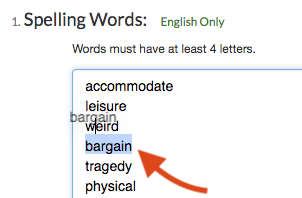 You can re-order words or sentences after they have been entered. If the input is a single text area, reorder words by selecting a word with the mouse, clicking on it and dragging it to a new position. If there is one input per item, click on the icon and drag the item to change its position. Click on the icon to delete an item.